Rock Hudson sang a song to Julia Meade's character in Pillow Talk. Julia Meade Kunz (December 17, 1925 – May 16, 2016) was an American film and stage actress who was a frequent pitch person in live commercials in the early days of television in the 1950s. Julia came to public attention in 1953 as the public face of the Lincoln division of the Ford Motor Company. She did live commercials on The Ed Sullivan Show for such products as Kodak cameras and Life magazine for years, earning recognition from TV Guide as the "favorite salesgirl" of the program's host. Her work on Broadway included the 1954 production of The Tender Trap, Mary, Mary in 1962 and The Front Page in 1969. She also appeared in Roman Candle and Double in Hearts She appeared on film in the 1959 movie Pillow Talk, 1961's Tammy Tell Me True and in Presumed Innocent in 1990 On TV Julia was a co-hosts of Spotlight Playhouse, a summer anthology program on CBS in 1959. 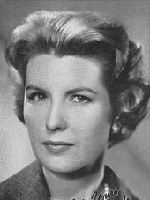 In 1969-1971, Meade hosted the syndicated program Ask Julia Meade, a daily broadcast "in which she answered ... letters from the viewers"about family matters. In the mid-1970s, she had another syndicated program, Julia Meade and Friends, on cable television. She was a regular on Club Embassy on NBC in 1952 and on The Dennis James Show on ABC, 1952-1954. 251 She also was a host of Playhouse 90 and appeared as a panelist on What's My Line? and Get the Message.